The Tribute to Tibet All Mountain is the quintessential front side ski. It excels in soft snow and light powder and has enough sidecut and power to lay it over on the groomers. This ski performs best for an intermediate to advanced skier. When designing skis, we do our best to choose partners and materials that come from the heart of Europe, where we live. 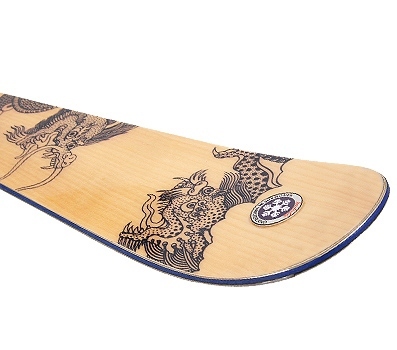 The Tribute to Tibet series of skis boast a full length White Ash core from the region, an FSC certified Maplewood Veneer, and has been engineered, designed, and handmade (by real people) in Switzerland. The versatility of these skis is a direct result of the combination of a tip to tail white ash core, titanal construction and smaller waist. Titanal Laminate Technology ( TLT) : White Ash / Titanal / Fiberglass core, P-Tex 5000, rockwell steel edges, split Black / Blue ABS sidewalls, bird eye maple veneer, UV protective varnish.